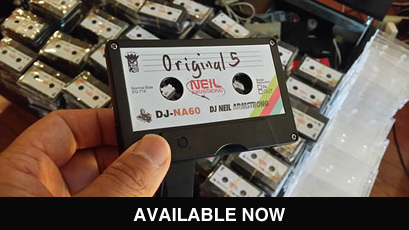 DJ Neil Armstrong DL ExtraOrdinary This Cd is the 2nd Installment of the AOK mixtape Series. A "Rock" mixtape, with no mashups. Stream it in its entirety for FREE below. Try before you buy... <iframe width="100%" height="60" src="https://www.mixcloud.com/widget/iframe/?hide_cover=1&mini=1&feed=%2Fdjneilarmstrong%2Fextraordinary%2F" frameborder="0" ></iframe> AVAILABLE NOW AS A DIGITAL DOWNLOAD – $6.50, immediate secure download. Complete Mix in Mp3 Format, tracked out and sent as a Zip File. Released last Year 2015 on USB cassette for the 10 year Anniversary of ExtraOrdinary For lack of a better label, a "Rock Mixtape" . For those who can't be put in musical genre box. Good music. Originally Released on Cassette USB. Warmfuzzy, originally dropped in 2005, this one is all about the cupcaking goodness of Valentine’s Day. Also known as Part 1 of the "All Out King Mixtape series (AOK for short), this series was meant to explore the whole spectrum of good music, not just the grouping of "urban" music most people who listened to my work would gravitate to. So everything from the Cranberries to Al Green made appearances on this one.